A post-free, no excavation, space saving solution. One of the fastest growing trends in the lift industry. 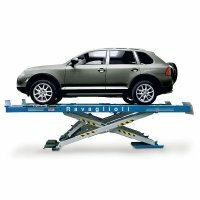 No more bending down to set the arms on a conventional lift.....RAV Double Scissors are one of the fastest growing lift trends present in today's automotive workshops. 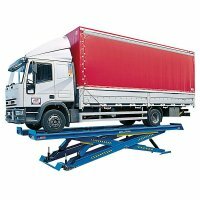 This ingenious design has many advantages over conventional lifting systems...primarily speed, convenience, and it saves significant space in today's cramped workshops. 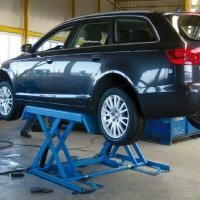 It has no posts or obstructions which are in the way, takes up excessive space and can damage the vehicle. It can be flush mounted so that none of the lift protrudes above floor level when it is down, but does not require deep excavation and fill-in like the in ground models. This lift is a real space saver due to the fact that it uses no posts for support like the 2 post and 4 post lifts. The double scissors has more than 6 feet of rise and is much faster to rise than conventional lifts. When this lifting system is all the way down you have essentially the same as a flat stall. It can be flush mounted into the floor for the cleanest look possible. The 500 series double scissor lifts are designed to maximize workshop space and technician productivity.